A Vanderbilt University Medical Center postdoctoral research fellow in the area of transplant outcomes research has added health literacy as a metric to an existing battery of surveys that assess patient-reported outcomes in Vanderbilt transplant patients. Health literacy is the degree to which an individual has the capacity to obtain, communicate, process and understand basic health information and services to make appropriate health decisions. 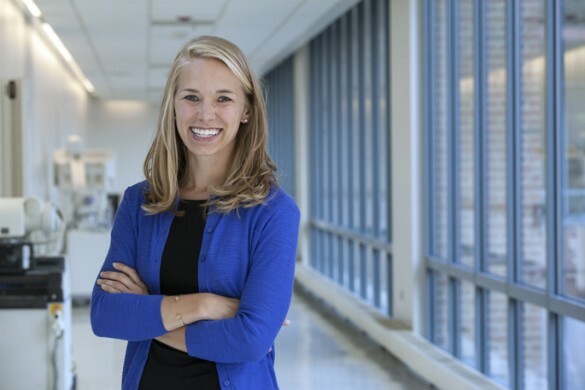 “It’s about how an individual learns about their health, and then uses that information to communicate with others and make informed health decisions,” said Leigh Anne Dageforde, M.D., MPH, from Louisville, Kentucky, a General Surgery resident and 2008 graduate of Vanderbilt University School of Medicine. Dageforde will finish her residency at VUMC following the completion of her research fellowship, and also plans to complete a fellowship in transplant surgery. Her research mentors are C. Wright Pinson, MBA, M.D., Irene Feurer, Ph.D., Derek Moore, M.D., MPH, and Kerri Cavanaugh, M.D., MHS. Her research was supported by the 2013 Association for Academic Surgery Research Fellowship Award. Dageforde’s addition of the health literacy metric expanded a survey-based program that has been in place at the Vanderbilt Transplant Center since 2002 and has focused on health-related quality of life, patient satisfaction and employment after transplantation. “This new work provides a better understanding of the strengths and weaknesses that exist for transplant patients and their caregivers in terms of their understanding of health information. In the future this may help identify ways to better communicate health information and improve health literacy,” said Feurer, Research Professor of Surgery and Biostatistics at the Vanderbilt Transplant Center. According to the Centers for Disease Control and Prevention, nearly nine out of 10 adults have difficulty using the everyday health information that is routinely available in health care facilities, retail outlets, media and communities. And this lack of clear understanding means that people are more likely to skip necessary medical tests, end up in the emergency room more often and have a harder time managing chronic diseases like diabetes or high blood pressure. Dageforde has established the validity of giving transplant patients written forms of a health literacy survey that was previously given verbally, and is the lead author of an article reporting those findings that will appear in the Journal of Health Communication. Her research also found that caregivers who accompany transplant patients to appointments usually have the same level of health literacy as the patient — an important finding for communicating health information to both. Dageforde said that much of what needs to be communicated to transplant patients can be complicated. “Health literacy can affect a person’s success navigating a complex health care process. We were hearing from our transplant center staff that in addition to the patients, many caregivers weren’t equipped to understand what they were being told and were getting overwhelmed. Health literacy impacts our patients and their caregivers every step of the way,” she said. Dageforde and colleagues, in work published in Transplantation, found that patients receiving a deceased donor kidney transplant had a higher likelihood of having low health literacy compared to living donor kidney transplant recipients. Screening kidney transplant candidates and potential living donors for low health literacy may identify patients with potential barriers to living donation and identify opportunities for intervention.